I have neglected your odonate-related needs, faithful reader(s?)! Behold, your odonate of the week. I picked an interesting one to make up for my silence. 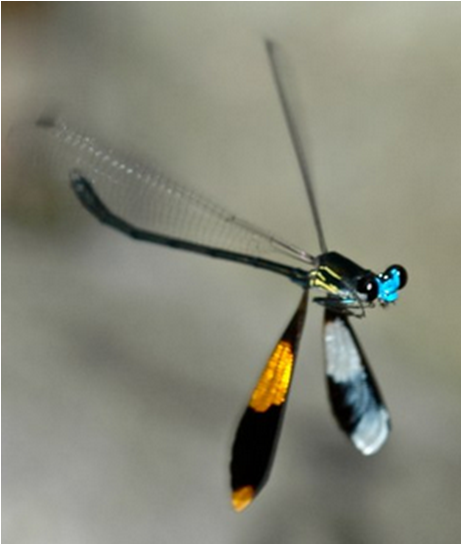 A lot of odonates have colourful wings. Some are black, some are pink, some (like Libellula pulchella) are multicoloured. However, Pseudolestes mirabilis is probably unique in the type of pigmentation that it possesses. In flight, it engages in territorial displays with other males. The pigmented hind wings are held still and low while the longer, unpigmented fore wings are used to keep the animal in flight. Males face one another like this in a war of attrition until one can keep up no longer and gives up. 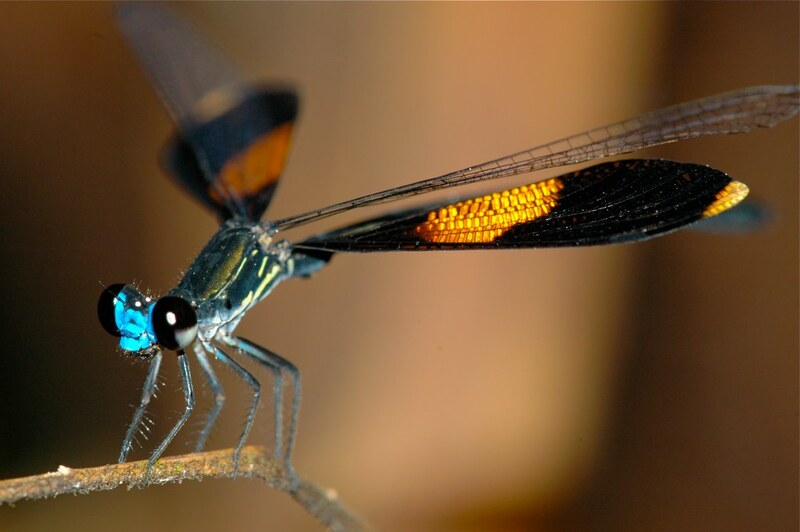 While wing pigmentation has been shown to be an indicator of male quality in a number of damselfly species, there has been a suggestion in this species that the wings form another purpose. The yellow and black bands have been proposed to lend a similarity to bees and wasps which are defended by stingers. Thus, the damselfly confuses predators into thinking that it is more dangerous than it really is. I’m not overly convinced, but I know that researchers are looking into it over the next few years, so hopefully we’ll have answers soon!